One great thing about the changing weather is that comfort food, like my delicious Baked Pork Chops and Apples, is back on the table. 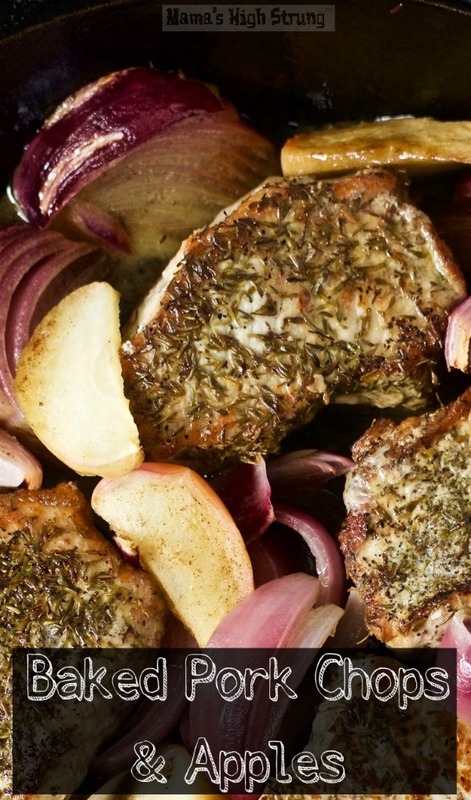 I really like this recipe for Baked Pork Chops and Apples because it’s quick and easy (of course). But if you hit the farmers markets, you’ll find an amazing assortment of apples that can really make this an interesting dish. I don’t know why pork and apples play so well together. Maybe it’s because pork needs the sweetness of the apples to bring out its flavor. Or maybe, if the pork is cooked properly, the apples add just the right amount of moisture to the meat to make the flavors pop. And speaking of overcooking your pork— don’t! If you like it dry and white and hard, that’s fine (yes, I’m judging). But, really, there’s like zero chance of you getting trichinosis or some other wild disease if your pork chops are slightly pink in the center. They’ll be moist and delicious and taste like they should, not like a cooked shoe. I’ve added a little apple cider vinegar to my Baked Pork Chops and Apples because it brings a little brightness to the dish. What is brightness? It’s that little mouth spark that you get when you first bite into something delicious that makes you want to keep eating it. Meat needs a bit of brightness because it has very little natural acid. And acid (think lemon juice) helps enhance flavors. Fall has fallen. Cooler weather is on the way. But there’s comfort in what I’ll be putting on the table over the next few months. Heat the oven to 425°F. Place oven rack in the center. Rub the pork chops evenly with the thyme and black pepper; set aside. Whisk the chicken broth, vinegar, cinnamon, salt and 1 tablespoon of oil together in small bowl; set aside. Heat a large cast iron or nonstick (oven proof!) skillet over medium-high heat for 1 minute. Add the remaining 1 tablespoon of oil to the pan and heat for 1 minute. Add the pork chops and cook for 3 minutes on each side or until brown; remove from heat. 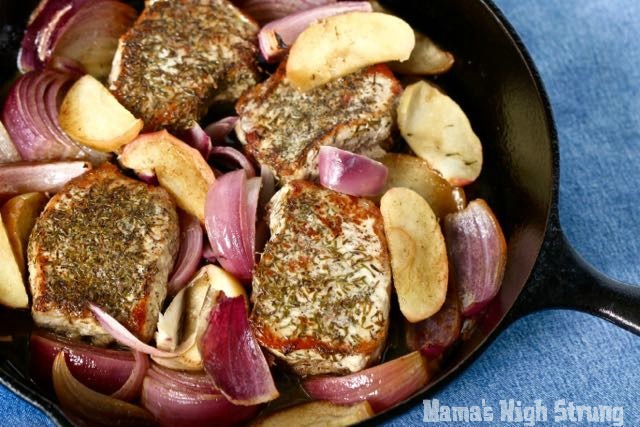 Scatter apples and onion wedges on top of the pork chops. Pour stock mixture over the apples, onions and chops. Bake for 10 to 15 minutes or until apples are light brown and the chops are at 145°F. Serve immediately, spooning the pan juice over the chops, apples and onions. You need to eat more fish. Salmon is good for you. You need to cook more and quit eating so much crap. Now that the kids are off the payroll, there are times when I come home and I’m so exhausted all I want to do is grab a bag of chips and salsa and see what’s on Netflix. You too? Thought so. Ok. That’s what I want to do, but I don’t because eating like that is a very slippery slope. You start with the salsa and chips and the next thing you know you’ve got a spoon in a tub of ice cream. And then the ice cream is gone. 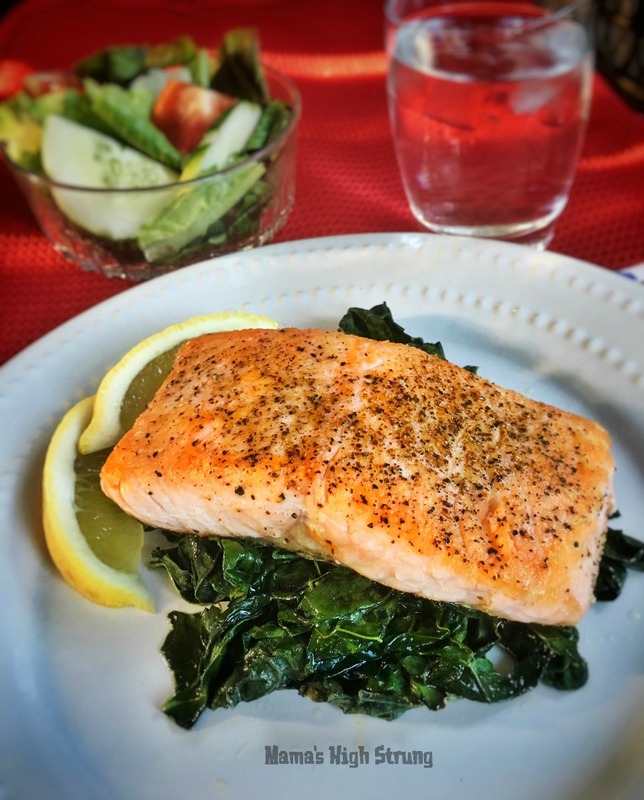 I like this recipe for Pan Seared Salmon because after I sear the fish, I sauté fresh kale or spinach with a little olive oil and whatever condiment I have on hand (right now I’m really digging Mother-in-Law’s Gochujang Sauce). Balsamic vinegar is nice, too, or even just a squeeze of lemon and a little salt. One other thing: while the recipe calls for searing salmon, you can use whatever fish you like (or is on sale). You’ll have to adjust the cooking time of the fish depending on the thickness, of course. Use a metal spatula to flip the fish (it will be easier to turn and you’ll preserve the nice crust). Now put those chips away and make yourself a quick and easy dinner. And, please, put that ice cream in a bowl! Sprinkle the salmon fillets with salt and pepper; set aside. Heat the oil in a large nonstick skillet on medium-high heat for 1 to 2 minutes or until the oil starts to shimmer. Place the salmon, flesh-side down, in the skillet and cook without moving for 3 minutes. Turn the salmon carefully and cook until firm, about 2½ to 3 minutes. Like this Pan Seared Salmon recipe? Here are more great fish and seafood recipes! 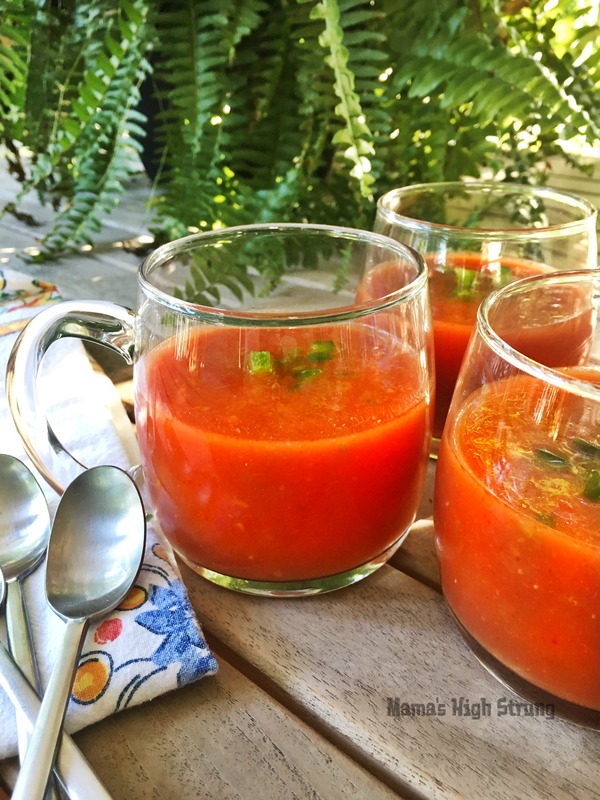 When summer comes, two things are certain: it’s hotter than a firecracker lit from both ends and there’s a big ‘ol pitcher of Chilled Red Gazpacho in my fridge. Gazpacho is a chilled vegetable soup from Spain. 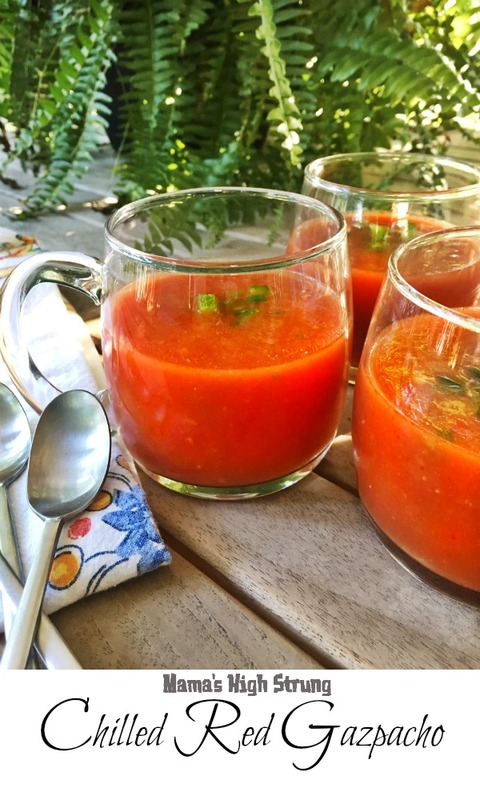 The word gazpacho originates from the Latin word caspa, which means “little pieces,” or something like that. Chilled soup might sound a little strange if you’ve never enjoyed one. They’re easy to make. Most can be done in a blender or food processor. All the vegetables (or fruit!) that you’ll need are usually in season, so you can enjoy them anytime of the year. They’re the ultimate “grab-and-go” snack or meal. Fill a covered tumbler or mug with this deliciousness and sip away! They’re made with vegetables (and fruit!) so you know you’re doing something good for yourself. They’re the perfect make-ahead meal. Double the recipe and you’ll have something for dinner tonight, lunch tomorrow and a little bit left over as an appetizer for guests. There are many types of Gazpacho, but the most familiar is this recipe for Chilled Red Gazpacho, made with fresh tomatoes. This is a perfect way to use up fresh tomatoes when they’re in season. 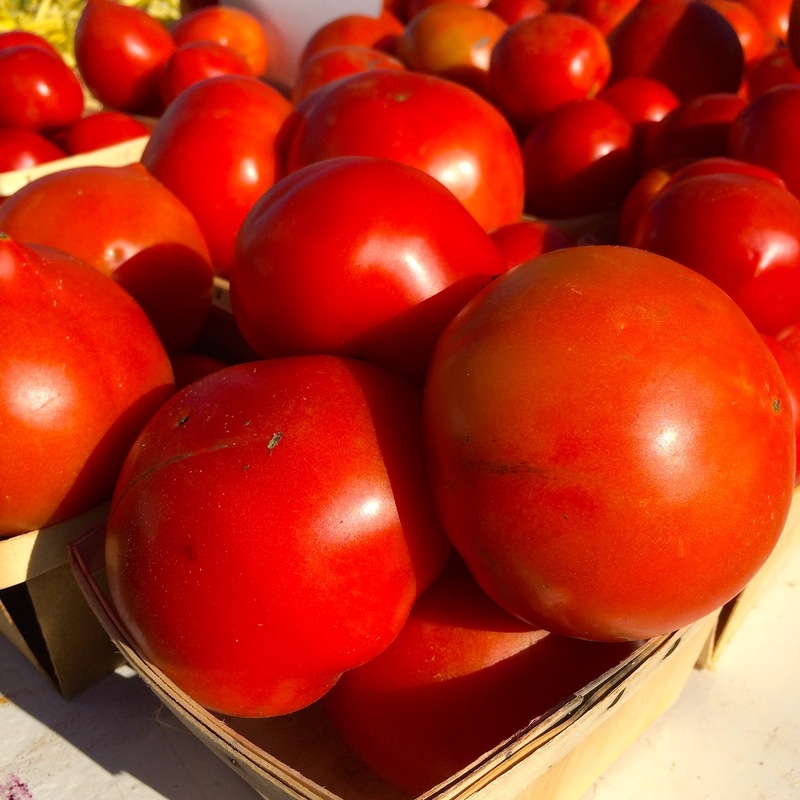 And, if fresh tomatoes aren’t available, use canned San Marazano tomatoes. ONLY San Marazano tomatoes. I like to serve the Chilled Red Gazpacho with finely diced tomatoes, cucumbers, red and green bell peppers and toasted bread croutons. Soak the bread in 1-cup of the water for 5 minutes. Squeeze out the excess water and place bread in a blender or food processor. Add the remaining water, tomatoes, red bell pepper, cucumber, garlic and vinegar. Blend or process the mixture until smooth. While the machine is running, slowly add the olive oil. Taste the gazpacho and add salt and pepper if desired. You forgot you had to bring an appetizer to the Cinco de Mayo fiesta, didn’t you? Not to worry, how about this Easy Cheesy Chorizo dip (also known as Queso Fundido). The best part? It’s only got 3 ingredients, but you can dress it up as much (or as little) as you want by adding chopped tomatoes, jalapeños, onions or cilantro. This tastes better if you make it at the party, so text the host to make sure it’ll be okay to use their oven and microwave (really quick!). Now get going… you’ve gotta go buy what you need. 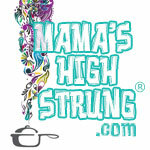 Mama can’t do everything for you! Wrap tortillas in foil and place in oven. Place an ovenproof 9-inch pie plate inside the oven to heat for 5-minutes. Remove hot pie plate from oven and add shredded cheese. Return pie-plate to the oven so cheese can melt, 6 to 8 minutes. Meanwhile, remove plastic casing from the chorizo (if there is any). Place chorizo in a microwavable dish. Using a spoon, cut chorizo into 1-inch pieces. Cover and microwave on high for 2 to 3 minutes. Drain excess grease. Remove melted cheese and tortillas from oven. 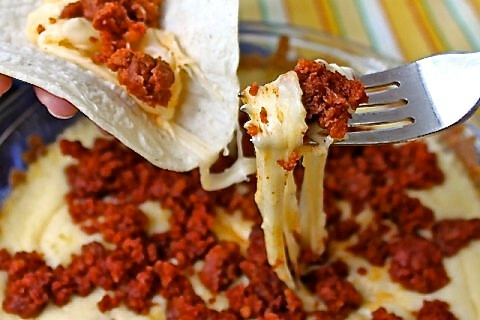 Sprinkle chorizo on top of cheese and serve with tortillas. • I used this cool Lekue microwave steamer to cook the chorizo. It comes with a tray at the bottom that separates the grease from the food, so, if there is a healthy way to cook chorizo, this is it. • I also used this beautiful Tortilla Warmer from Camerons Products. It heats up in the microwave for 45 seconds and keeps your tortillas hot and soft for more than an hour after they come out of the oven. 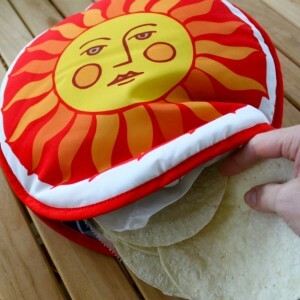 It even holds the big 12-inch tortillas.